Let’s face it, winter is no fun when it comes to gardening in the South Sound…not outside hands-on gardening. Those dedicated gardeners who get a thrill from getting soaked and like sloshing through puddle lawns or rubbing up against rain-soaked evergreens are in the minority. Personally, I like my shortened, darkened winter gardening days inside the house, curled up in a warm, dry room with a stack of gardening books within easy reach. You may have noticed that gardening books have reached a saturation point. There are only so many times you can be awestruck by the same pictures of the same unattainable grand gardens and not come away a little…bored. We all know how beautiful they are and we also know the number of gardeners necessary to maintain that beauty. And here we are…in gardening heaven with our small yards, some shiny new containers and lots of enthusiasm. All we need is good, solid information, accompanied with some attainable plans and some inspired suggestions. Luckily, we have a publisher like Portland’s Timber Press and a new book called “The Timber Press Guide to Gardening in the Pacific Northwest” to supply the information we need. 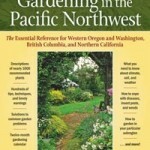 Unlike some “northwest” gardening books that include areas as diverse and far away as North and South Dakota, “Gardening in the Pacific Northwest” sticks to Western Oregon and Washington, British Columbia and Northern California. That’s more like it! The authors, Carol and Norman Hall, have lived in and gardened in many parts of the PNW. They speak from experience, not from the rehash of old research…and it shows. A list of plants that will grow and thrive in the PNW takes up the last two thirds of the book. This section has plenty of detailed information about where the plants originate, their growth habits, their needs and any little tidbit the Hall’s have observed while growing the plants themselves. But it’s the first one third that makes the book different. The Timber Press Guide opens with the basics about our climate, soil and weather patterns. After giving us the “glass half empty” elements of the basics (high winds, torrential flooding rains, mild temperatures that allow insects to over winter and multiply, ice storms and the occasional debilitating snowfall), the Hall’s tell us the PNW is “an Eden after all”. Then the Hall’s explain why gardening in our area is different from gardening anywhere else. Our geography is diverse and our climate is all over the place. This allows plants from every corner of the world to survive. Besides our native species, the Halls tell us we can grow plants from Japan, Northeastern Asia, China, the Mediterranean, Europe, Great Britain, New Zealand, Australia, Southern Africa and Central and South America. A Twelve Month Calendar with an extensive plant list is included. It also covers insects, diseases, weeds and environmental and physiological problems. It isn’t the same old stuff…it has new information and is written specifically for us.